Baidu: Is China's Google better than Google? 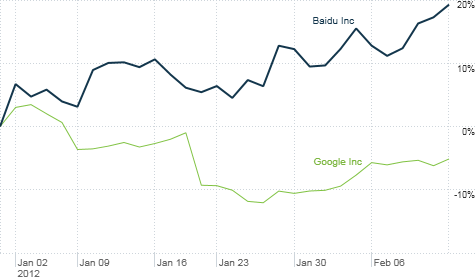 China's Baidu has outperformed U.S. search leader Google so far in 2012, and appears to have better growth potential. 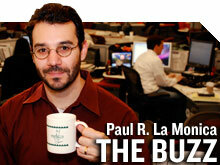 NEW YORK (CNNMoney) -- Baidu is often referred to as China's Google. That might be insulting to Baidu. Baidu (BIDU) is the market share leader in online search in China. Its lead over Google (GOOG, Fortune 500) there is much larger than the lead Google enjoys over rivals Microsoft (MSFT, Fortune 500) and Yahoo (YHOO, Fortune 500) in the United States. Of course, Google is at a disadvantage because it has willingly cut back on its presence in China due to concerns over censorship by the Chinese government. Since 2010, Google's google.cn site has prominently included a link to Google's Hong Kong site for unfiltered results. Still, Baidu appears to have far more growth potential than Google at this point. The question is whether or not the stock price already reflects that. Right now, it does not look like Baidu is too expensive. Baidu is due to report its fourth-quarter results on February 16. Analysts expect that earnings per share rose 82% and that sales jumped nearly 90% from the fourth quarter of 2010. By comparison, Google's earnings increased 6% and sales rose 25% in its most recent quarter. Google currently trades at 14 times 2012 earnings forecasts, far below the multiple of 30 times 2012 earnings estimates for Baidu. But Baidu's earnings are expected to increase 54% in 2012 and at an average of 48% annually for the next five years. Google's earnings are expected to rise 17% this year and at an 18% average clip for the next few years. Dan Su, an analyst with Morningstar in Chicago, said that Baidu still appears to have "a long way to go" in terms of earnings growth. Because of its potential, investors don't have to be too worried about the current price, she said. In fact, if you use a valuation measure that factors in both the price/earnings multiple and long-term growth -- the so-called PEG ratio -- Baidu is actually a bit cheaper than Google. Google's PEG is 0.8 while Baidu has a PEG of 0.6. Google's issues with the Chinese government are unlikely to be resolved in the near future. As long as China remains a nation with strict censorship, Google will most likely continue to limit its presence there. That's exactly what Facebook, which could be viewed as a potential Baidu competitor, appears to be doing as well. Facebook said in its IPO filing earlier this month that it was unsure it could find a way to do business in China that would be "acceptable to us and to the Chinese government." That means that Baidu probably deserves a premium to Google and other U.S. Internet firms by virtue of the fact that it won't face a true, direct threat from them anytime soon. Baidu is also trading at a discount to some smaller Chinese Internet companies. Qihoo 360 (QIHU), the owner of one of the top Web browsers in China, trades at about 37 times 2012 profit forecasts. Sina (SINA), which owns microblogging site Weibo (i.e. China's Twitter) is valued at nearly 50 times earnings estimates for 2012. And then there are companies like social media firm Renren (RENN) and online video site Youku (YOKU). You can think of them as China's Facebook and YouTube respectively. They both are expected to lose money this year. Baidu is clearly the best of the Chinese dot-coms, and the stock has enjoyed a solid start to 2012, gaining about 19% so far. But that follows a tumultuous end to 2011. Even with this year's rally, Baidu is still trading about 16.5% below its 52-week high. Baidu and many other Chinese Internet stocks were hit hard thanks to accounting concerns about another Chinese tech firm, digital advertising company Focus Media (FMCN). The influential short-selling research firm Muddy Waters slapped a "strong sell" rating on Focus Media in November. Muddy Waters analysts accused the company of fraud, saying that it had overstated some financial numbers and may have overpaid for some companies it acquired to hide losses. Focus Media executives have denied the allegations. But Baidu is no Focus Media or Sino-Forest, the Chinese timber company that also came under suspicion of fraud following a critical Muddy Waters report. It's telling that less than 2% of the available shares on Nasdaq for Baidu are held by short sellers. This is not a company that bears are targeting. Morningstar's Su said that most accounting concerns regarding Chinese companies appear to be centered around much smaller companies. Baidu is generating revenue in the billions of dollars and has a market value of nearly $50 billion. This is not a small, thinly traded company. Baidu has also established a pattern of topping quarterly earnings forecasts. Analysts and investors will be expecting the company to do so again on Thursday. It seems like a foolish wager to bet against Baidu at this point. Best of StockTwits: What's the bigger mania right now: Apple (AAPL, Fortune 500) stock or Jeremy Lin? Apple topped $500 for the first time Monday while shares of Madison Square Garden (MSG) are surging on the back of Linsanity. EddyElfenbein: $AAPL was at $50 in October 2005. Ten fold increase in less than 6.5 years. This is stunning. But it appears justified when you look at the monumental growth in sales, earnings and cash flow that has taken place during that time frame. It's true that Apple hitting $500 may cause some investors to pull back -- it's an important psychological level. But I'm not sure that Apple at $500 will or should usher in a wave of critical second-guessing of the valuation. After all, Apple is still trading at just 12 times fiscal 2012 earnings estimates. That is insane. Not be confused with Linsane. It does make you wonder if Apple stock could be too much of a plaything of hedge funds and traders right now. douglas_blake: #Linsanity could be a major catalyst for shares of $MSG. Asian basketball fans are affluent, loyal and obsessed! This is a broad generalization, of course. But it is true that Yao Ming attracted a huge following in Houston when he was playing for the Rockets. Japanese baseball players in New York, Boston and Seattle have also helped lift ticket and merchandise sales. So if Lin continues to play as well as he has, you would have to think that the Knicks would be able to capitalize on the large number of Chinese and Taiwanese residents in New York City. And as a Knicks fan, I hope Super Lintendo is more than a one-week wonder.